"A favorite for potlucks, family gatherings, and hot summer nights at home. With a food processor to chop the kale, I can be done and out the door to a party within 25 minutes - and that includes 5 minutes to find my keys. My kids love this salad when I add lots of apples!" Massage salt into kale in a large bowl until kale is slightly softened, about 2 minutes. 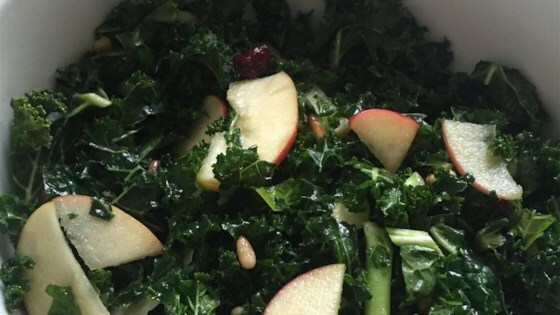 Gently stir apples, olive oil, cranberries, sunflower seeds, and vinegar into kale until salad is evenly mixed. Gently fold Gorgonzola cheese into salad. It is very important that the seeds are unsalted. If you only have salted seeds, massage the seeds into the kale. For a more summer taste, substitute raspberry vinegar. The sweet and crunchiness of Honey Crisp apples work the best, but Gala or Fuji are good too. Don't be scared to add more or less of any ingredient. I add more apples when I know kids are going to be eating the salad. Easy to make and tasty this salad is a hit! Used roasted pumpkin seeds and feta cheese. Great! This is a really easy, delicious, healthy salad. I omitted the cheese and didn't miss it at all, but I'm sure it's equally good with it. Great way to use up all of the kale from our garden!